As mentioned in my article, “Letting the Good Times Roll: Some Mardi Gras Inspiration for Game Night!,” I went to New Orleans, Louisiana last September. While there, I got to try all kinds of amazing foods that spanned a full pallet of flavors! Some, like the beignets from Cafe Du Monde, were very sweet and others, such as the corn and crab bisque that we were taught to make while attending a lesson at the New Orleans School of Cooking, were hot and spicy! This Mardi Gras, I’d like to pay homage to everything I learned in the Crescent City as well as upholding my own family’s traditions for the festival so I’m going to provide you with a little bit of both! When I think back on my trip, I think not only of the fun and the people I encountered as part of the tour as well as the residents, but of the divine foods and how they seamlessly blend with the diverse types of music that is often filling the streets. In my opinion, the flavors of New Orleans are what leave the biggest impression on its visitors; they dance across one’s tongue almost as well as the patrons jiving to the live jazz all over town. 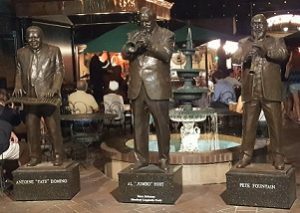 With Zydeco and Dixieland/New Orleans Jazz playing in the background as I cook, I find myself transported back to the jazz halls and bars on Bourbon St. However, it also reminds me of the groups jamming on and in Franklin Avenue, which we only made the trek towards after a few restaurant and lounge suggestions from our gracious host from our evening at the New Orleans School of Cooking. Corn and Crab Bisque as taught to me while visiting The Big Easy! After that fabulous night filled with folklore, laughter, exceptional food and beer, and learning some new-to-me cooking techniques, I also walked away from my class from the New Orleans School of Cooking wth a few recipes – and, later, a cookbook! My favorites from the evening are the corn and crab bisque and the jambalaya recipes. As I’m already serving a mild shrimp gumbo on rice, I wanted to include something with some heat to it as well as a few less carbs so I decided to go for the corn and crab bisque as an option for my friends. 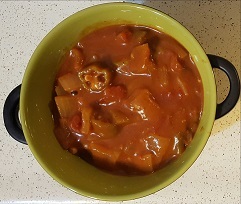 This is a recipe you can make as mild or hot as you’d like and I tend to leave the bottle of liquid crab boil nearby so people can add more heat if they want it. Combine milk, heavy cream, and stock in a large pot. Bring to a boil, then reduce to a simmer for 10-12 minutes. Combine flour and butter to make a roux; add to simmering pot once desired color of roux is reached. 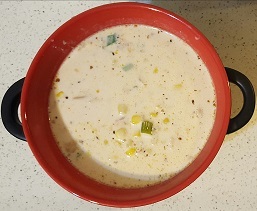 Stir in corn with liquid and crab meat. Simmer for 5 minutes. Gradually add in 1 c of green onions, salt and seasonings to taste. Garnish with parsley and green onions. Serve. A steamy bowl of my grandmother’s shrimp gumbo. The recipe provided has been slightly modified from hers due to food allergies in my group. For years now, I have made my grandmother’s shrimp gumbo for Mardi Gras. It has been one of my favorite recipes of hers for decades with the wonderful combination of shrimp, tomatoes, peppers, onions, and okra and I can already feel my mouth beginning to water just thinking about it! Most of my family doesn’t like a lot of heat to their food, so this is an extremely mild (no heat at all, honestly) gumbo recipe. It can be made ahead of time and stored in the freezer or stored after being made – just remember not to mix in the rice if you’re going to store it! The recipe below is a slightly modified version of my grandmother’s. Melt butter. Stir in flour and cook over low heat until slightly brown. Add garlic, onions, and green pepper; cook slowly until tender. Add tomatoes and the rest of the ingredients except for rice, shrimp, and parsley. Simmer uncovered for 45 minutes. Cool; refrigerate until ready to serve. To serve: heat tomato mixture over medium heat until just boiling; add shrimp. Simmer covered for approx. 5 minutes until shrimp are pink and tender. Combine rice with parsley. Plate rice and parsley combination and top with gumbo. A taste of the Crescent City brought to my home! 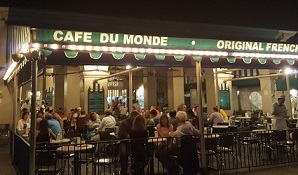 If you’re in a rush or are worried about finding a good recipe, Cafe Du Monde has put together a box mix and sells their coffees online and in some specialty stores! What would a celebration be without dessert? Traditionally, there is a King Cake, but, as I didn’t have time to make one this year, I’m probably going to order one from my favorite local bakery: Ettore’s! They’re offering them in chocolate pecan, cherry, or apple this year and, I will admit, I’m having a hard time deciding which one I want. However, I’m also going to be serving beignets! Though I can also order these from Ettore’s (only on Tuesday, however! 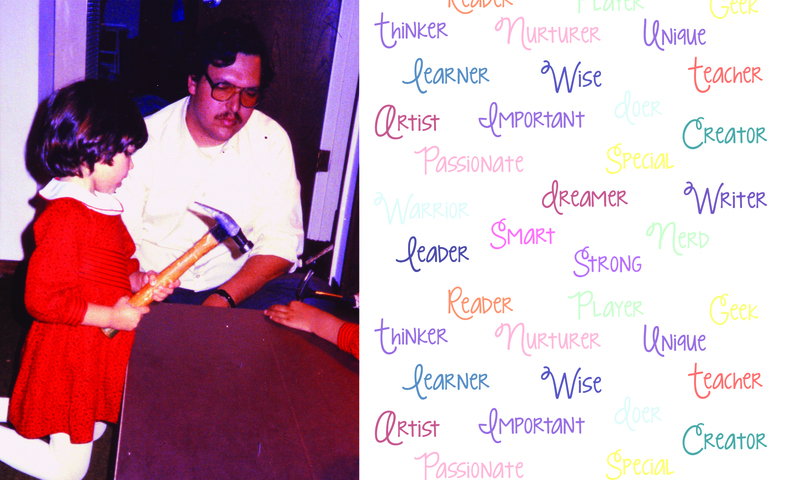 ), I have decided to make them myself! There are tons of recipes available for these and some of them even have fruit in them! 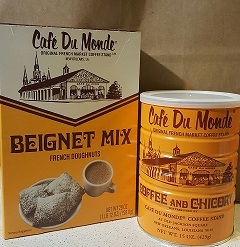 This year I will not only be making a few from scratch, but I also picked up a Cafe Du Monde box mix so I can compare my recipe to their mix. After serving Abita beer with the main courses, I’m going to serve my desserts with, you guessed it, chicory coffee! Hope you enjoy these recipes and have a happy and safe Mardi Gras! Previous PostPrevious The Key Armory: The Source For Great Nerdy Keys For My Home! Next PostNext Pizza Pies for Pi Day 2017!